Home» AP LATEST UPDATES | TS LATEST UPDATES » UPSC Combined Medical Services - 2016 Notification/Online Application at upsc.gov.in . 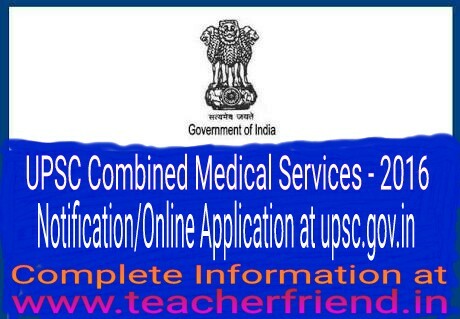 UPSC Combined Medical Services - 2016 Notification/Online Application at upsc.gov.in . Candidates to ensure their eligibility for the examination: The candidates applying for the examination should ensure that they fulfil all eligibility conditions for admission to the Examination. The online Applications can be filled upto 01st April, 2016 till 11.59 pm after which the link will be disabled. downloading by candidates. No Admit Card will be sent by post. All the applicants are required to provide valid and active E-mail i.d. while filling up Online Application form as the Commission may use electronic mode for contacting them. (d) a Tibetan refugee who came over to India before the 1st January, 1962 with the intention of permanently settling in India. Lanka or East African Countries of Kenya, Uganda, the United Republic of Tanzania, Zambia, Malawi, Zaire and Ethiopia or from Vietnam with the intention of permanently settling in India.Provided that a candidate belonging to categories (b), (c), (d) and (e) above shall be a person in whose favour a certificate of eligibility has been issued by the Government of India. Upto a maximum of three years in the case of candidates belonging to Other Backward Classes who are eligible to avail of reservation appicable to such candidates. of dismissal or discharge on account of misconduct or inefficiency.